Sometimes, you need a great gift idea for a child in your life that doesn’t involve more stuff. Whether your kid has a room brimming with all the latest toys, or you’re just not into giving material gifts, the trend of downsizing holidays and gearing more towards making memories is growing. For many of us growing up, the gift giving portion of the holidays always focused on the latest stuff. Those of us in our 30’s remember having boxes under the tree with everything from Cabbage Patch Dolls to Super Nintendos to Popples to Transformers and more. Seems that kids these days have SO much stuff that they don’t appreciate it, and barely remember what the gift was or who it came from. Parents now are trying to come up with alternative gift ideas, and one that is gaining popularity is Experience Gifts. This kind of gift focuses on an event or experience (aka: making memories) rather than just accumulating more toys, whatchamacallits and thingamajigs. An experience gift can be anything from a vacation to just spending one-on-one time with the recipient. 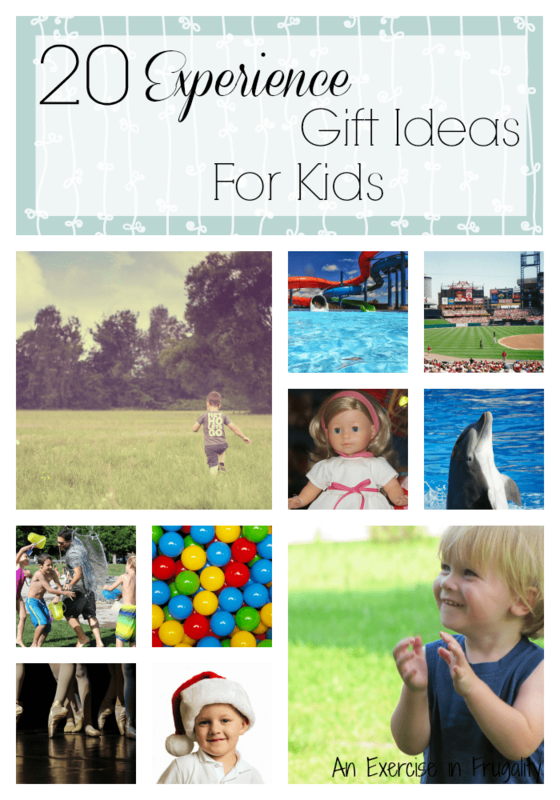 Some gifts don’t have to cost anything, and some may replace gifts for birthday and holidays. It just depends on preference and cost. These ideas are especially fun because they encourage togetherness. If these are your children, your nieces and nephews or grandkids, it is a great way to create memories of fun times spent TOGETHER. Apple, pumpkins and other fruit make for great picking, and great memories. other options include local farms which may offer tours, or allow kids to pet animals, milk cows, and learn what life is like on a farm. These can be a ton of fun, plus again, educational! If money is tight in your family, chances are there’s not a lot left in the budget for extra-curricular activities. Could you grant the wish for them if it was in lieu of tangible holiday gifts? If your child is heart-set on taking ballet or a special art class, what better time than the holidays to make their dreams come true? If it’s something your child really loves, this will make for a special moment that they will cherish all year long when they are participating in their favorite activity, which will in turn create MORE memories when you watch them perform or compete! If you’ve never done it, a train ride can be a fascinating journey…for the right child. A dreamer or creative and imaginative child (or one with an interest in trains of course!) will love the mystery and whimsy of a locomotive chugging along the tracks to a fun destination. Perhaps reading the Polar Express during your journey? They can pretend they are on their way to Hogwarts too. Road trips can be made fun, as you research a handful of fun destinations (kooky roadside attractions perhaps?) Pack some lunches and snacks and hit the road. Older children can help plan the journey and even navigate. You can go local, or long-distance, all those places your kids want to go (“MOM! The World’s Largest Rubber Band Ball!! Can we stop! ?”) that we’re always too busy to check out. If you’re from the midwest, chances are you’ve heard of Wisconsin Dells. It’s claim to fame is that it’s the “Waterpark Capitol of the World”. There are sometimes deals for trips there, such as a Groupon, but between the admission, the hotel, the food and drinks, the trip can be expensive especially if you have more than one child. It’s the perfect idea for an experience gift (because going there is quite an experience!) and if you are giving it in lieu of gifts, the recipient is going to be so excited for the trip, they won’t miss not getting yet another toy. This gift idea is a little different. It’s not so much a physical experience for the recipient but rather an emotional or spiritual one. Harvest of Hope is an organization where you can give someone the gift of hope-by sponsoring a child, donating money to purchase specific needs such as seeds, sewing machines and medical supplies. This would be a great way to teach children about the importance of giving to those in need. These will vary by location, but you can get a guided aerial view of your city, or even better, a historical lesson with a guided helicopter tour of Washington D.C. Fun for children of all ages! This is a once in a lifetime kind of “bucket list” activity that is fun for kids and adults. Do a little research and you can find one in an area near you. Twin Cities Trapeze Center (among many others you may find in your area) offer Trapeze classes for the adventurous folks. Many schools offer classes for children (TCTC offers classes for kids 6 and up) This would be an awesome gift for the active kids in your life who love to flip, climb and tumble! This gift doesn’t have to cost a thing. It can include whatever your imagination desires. Anything from a trip to get ice cream, to a coupon entitling the recipient to have their room cleaned for them, to a pizza party and more. Whatever you can think of, can be put into a cute coupon book of treats for the child to use as they please. This is a ‘gift that keeps giving’ long after the buzz of the holiday season is over. People travel from all around the world to go to the Mall of America, and right across the street, we have the Waterpark of America-the largest indoor water park in the country. Whether you are local to the area, or from out of town, the Waterpark of America is an awesome trip (water park in the winter?!). You can stay the night, or just make a day of it. Some aquariums offer season or yearly passes, and some of the larger ones offer really cool overnight stays too! Check out the options in your area and see if any of them offer overnight stays or parties. Imagine falling asleep beneath a giant swirling pool of fish! With the introduction of movies like the Hunger Games and Brave, Archery has become crazy popular in the recent years (especially with girls). If your little hunter or huntress is interested in giving the bow a go, then archery lessons may be just the ticket. This is another flexible option that can be as costly or inexpensive as you wish. You just select 12 “adventures” for the recipient, and present them in any number of creative ways. You can choose to tell them all 12 events in advance, or keep them a surprise until the day of. This again can be anything from a special movie date at the theater to see a movie of their choice (with treats of course) or any number of fun events/activities. You could include free options too, like a picnic lunch at the beach, or sledding and hot chocolate. Be creative! This was so popular when I was a kid, and it is finally gaining popularity again. If you have a child who is fond of horses (what little girl doesn’t love ponies??) this is a great way to get them acquainted with the animals, and then they get to ride around, imagining they are a cowboy or girl, or princess, or knight…the possibilities are endless. Check your local area for stables that offer lessons or excursions. You can get tickets to a great number of sporting events, whether it be basketball, wrestling, cheerleading competitions, figure skating, or whatever your little one is into. You can get multiple tickets for them to go with you, and/or bring a friend. The idea is creating lasting memories and bonding! If you’re looking to go big, season tickets are another great option too. Rather than getting your American Girl fan another doll or outfit, why not have an experience that includes her American Girl doll? The American Girl stores offer doll salons, lunches and high tea with dolls and more. The experience can be spendy, and if you’re not close to one, it might not be an option for you, but get creative! If you don’t want to shell out or can’t get to one, do a custom American Girl experience at home. Spend the day pampering her and her doll, doing facials, styling hair, and dressing up for tea–all focused around her special doll.